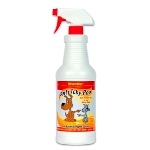 The original Anti-Icky-Poo quart with a trigger sprayer is our most popular item. If you have just a small area to treat, but want to be prepared for the next incident, one quart just might be what you need. It is maneuverable in tight spaces and the trigger has a long enough stream to get under heavy furniture and other places the animals have sprayed.